Het is vandaag op de kop af 50 jaar geleden, dat ik op 25 juni 1967 voor het eerst de LP Sgt. Pepper's Lonely Hearts Club Band hoorde. We waren met een groep van onze zwemclub op een langebaan wedstrijd. We hebben de wedstrijd van 2 kilometer gezwommen. Nadat we weer omgekleed waren en langs de baan zaten, klonk in eens uit de speakers van het PA systeem Sgt. Pepper's Lonely Hearts Club Band. We hebben ademloos zitten genieten van de hele LP tot en met de uitloopgroef van kant twee aan toe. De LP was kort te voren uit gekomen. In mijn herinnering heeft het nog enige tijd geduurd voor ik zelf de LP heb aangeschafd. Het is ongelooflijk, maar de nummers op Sgt. Peppers Lonely Hearts Club Band klinken nog steeds fris, zelfs nog na 50 jaar. Oplettende lezertjes hebben wellicht de bijzondere datum 25 juni 1967 herkend. Inderdaad dat was de dag dat 's avonds All You Need Is Love door ongeveer 400 miljoen mensen op 5 continenten werd bekeken in het programma Our World. Dus dat was dubbel genieten. Maar niet voor iedereen. Want toen we weer thuis waren hoorden we het nieuws over de windhoos in Tricht. 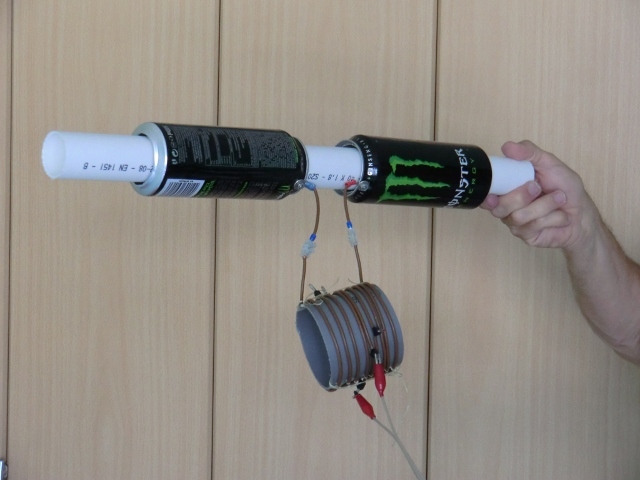 Last year I used the cylinder dipole with two Monster cans for 21 MHz. 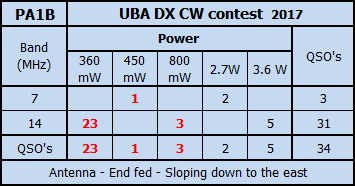 in the results of the 2016 CQWW WPX CQ contest of last year. See My Blog post on the article. This year I used an end fed antenna for 14 MHz, that is sloping down to the east. In total I made 91 QSO's. I did not use a fixed power. When the signals go up, I reduce my power. The power that I used, varied from 3.6 watts down to 3.6 milliwatt. All QSO's were made with the lowest possible power with search and pounce. S&P. I started on Saturday on 14 MHz and when I stopped there were 40 QSO's in the Log. On Sunday morning I first made 11 QSO's on 7 MHz. Then I went to 14 MHz to make about 40 more QSO's. 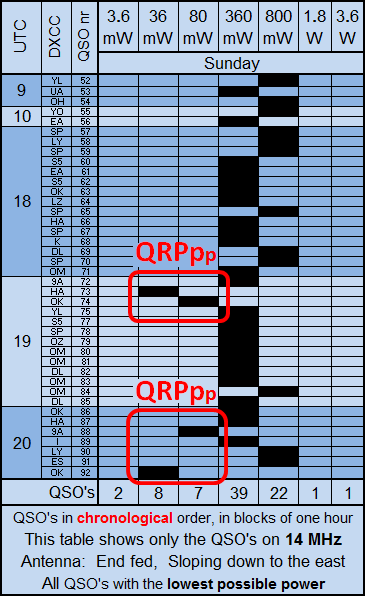 As a milliwatt enthusiast the emphasis of my activities lays on the use of QRPp. On 14 MHz I made 39 QSO's with a power of 360 mW and 22 QSO's with 800 mW. When the signals go up, I reduce further below 100 mW. 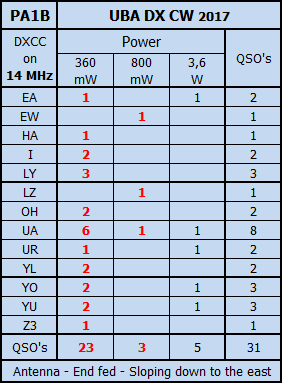 The table shows 18 QSO's with less than 100 mW, with 2 QSO's with a power of 3.6 milliwatt. On Saturday I started after 16:00 UTC. In the first QSO I probably was too eager to use low power, that I am not sure whether the QSO is valid. After 18:00 UTC till 20:00 UTC the signals peaked, with 6 QSO's with 36 mW and two QSO's with 3.6 milliwatt. An important indicator for the power that I can use, is the S-meter. The signals in the two QSO's with 3.6 milliwatt were ear splitting. To get an indication of the signal strength, I switched in the attenuator of 20 dB. The S-meter still gave a value of S+. This means that the signal strength is S+ plus 20 dB. Hi. 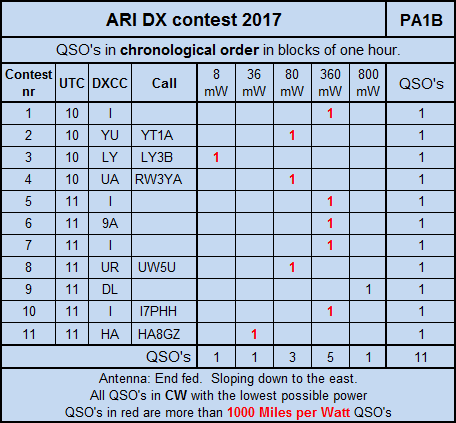 I had great fun with low power in the ARI DX contest. This year it was not that easy, because of QSB. But nevertheless I made a total of 11 QSO's with 8 mW up to 800 mW. Sometimes the QSB (fading) made it very difficult. But it's also a sport to choose the right moment to answer the CQ. I start answering before my signal peaks to make the QSO. My signal has to be also in the clear. In QSO number 3, the signal of LY3B went up slowly, so I had to listen very carefully to work him with 8 mW. For the QSO with I7PHH I had to wait for the signal to go up, to make the QSO when my signal peaked. Hi. In the last QSO with HA8GZ there was no QSB. But when I look back in my notes on paper, I see, that I heard many stations, that I have not work because their signals faded. I met 3 very skillful operators with excellent ears in QSO number 2, 3 and 4. YT1A with 80 mW, LY3B with 8 mW and RW3YA with 80 mW. Well done gentleman. I am not the strongest station on the band, but when my signal is in the clear, these skillful operators with will answer my call, what ever my power may be. Hi. It is all a matter of propagation. 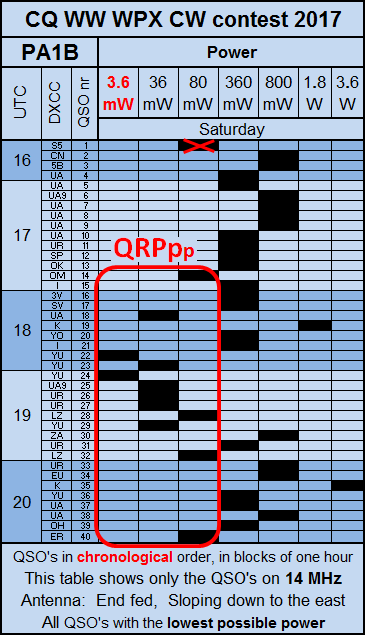 The table below shows the QSO's in chronological order in blocks of one hour. 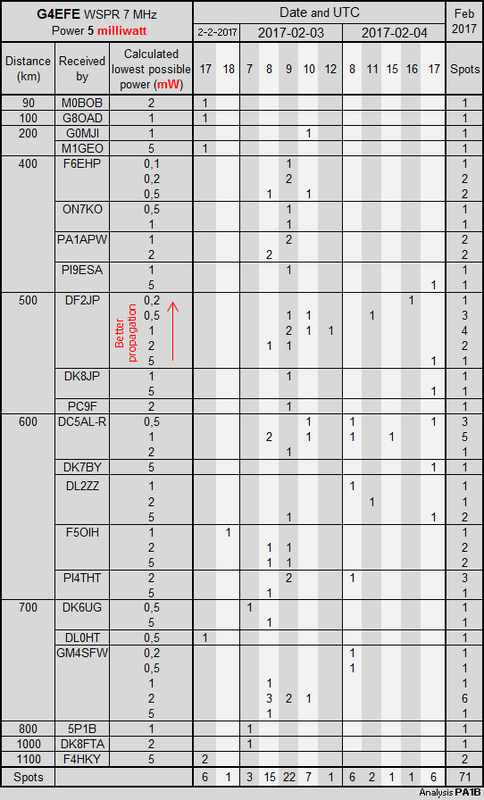 The table shows the power that I used from QSO to QSO. 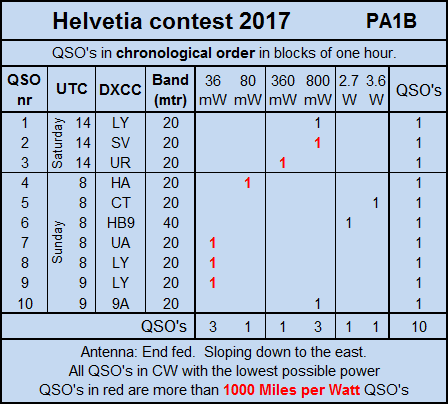 I had fun in the Helvetia contest 2017 with low power. Even though there was QSB, I still could make some beautiful QRPp QSO's. I got a request from Panagiotis SV1GRN to write a more detailed story. Yes, you are right, Panos. It's my pleasure to make the update. hi. 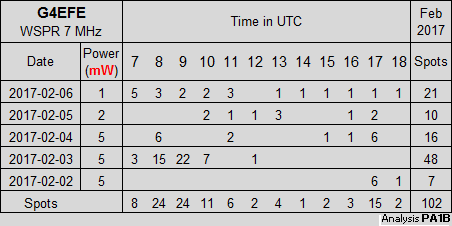 The first table shows the QSO's in chronological order. This is very interesting, because it shows, which power I used from QSO to QSO. I started on Saturday with just 3 QSO's. The signals were S9, S9 and S+. When I started on Sunday, I heard HG7T with a very strong signal. S8 + 20 dB. But then the QSB kicked in. The signal strength dropped about 10 dB and I had to use 80 mW to make the QSO. That is how it goes with QSB. hi. In the next QSO with CT, I had to use full power and I had to repeat my serial number. hi. Then I went to 15 meters. The band was empty. So I went to 40 m and made a QSO with HB9MM in VD. I decided to go back to 20 m and made 3 QSO's with 36 mW. QSO number 8 with LY3B was exciting. 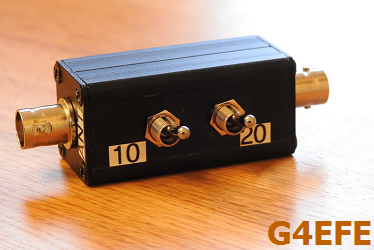 The QSB reduced the signal strength, just after the QSO was completed. hi. In the last QSO I had to QRO to 800 mW, (QRO means increase my power), before my signal was heard and the QSO was made. This weekend there was much activity from South America, so I joined the fun in the CQMM DX in which you can work every station. 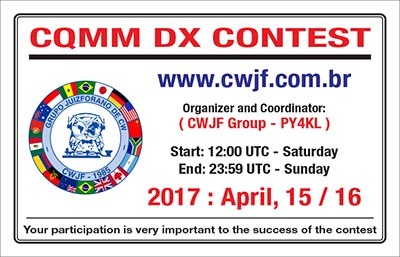 In the CQMM DX contest a QRP station is immediately recognized by it's exchange. My exchange is be 599 EUQ meaning continent Europe and QRP. is a 2 way QRP QSO when I receive such an exchange. hi. 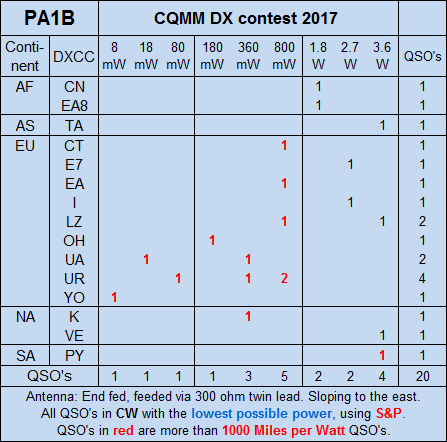 CQMM DX was this weekend. I hope to meet you next year. 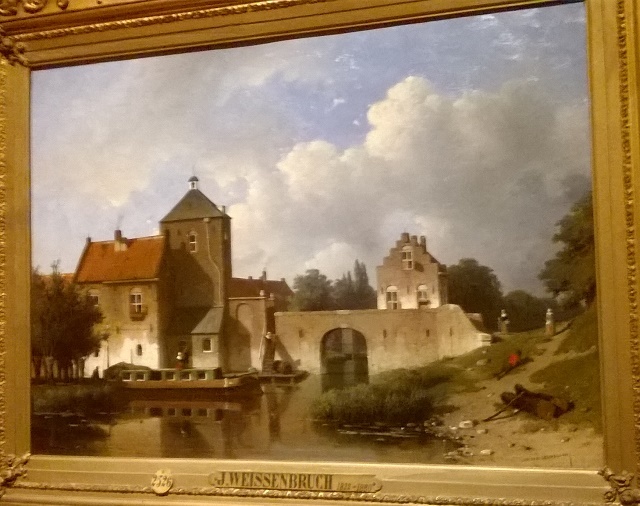 In januari heb ik een tentoonstelling bezocht van prachtige schilderijen van de schilder Jan Weissenbruch (1822-1880) in het Teylersmuseum in Haarlem. Weissebruch heeft een aantal schilderijen gemaakt in het rivieren gebied. Ook in Culemborg. 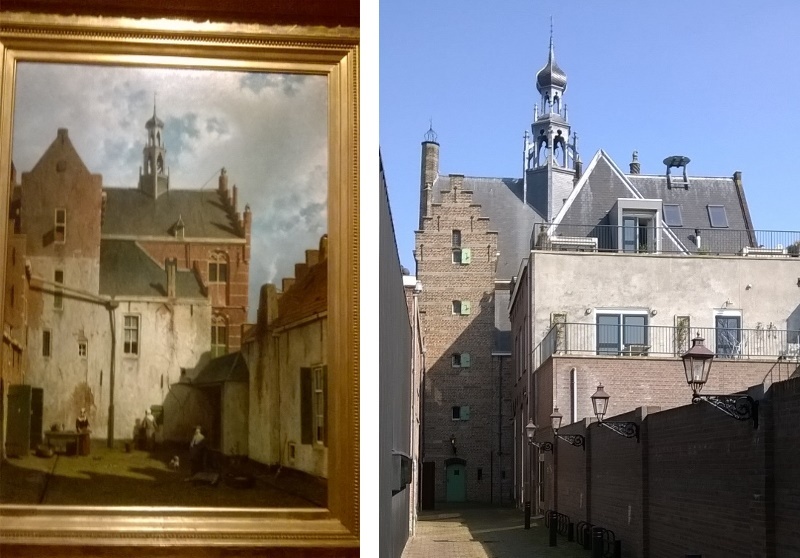 Een van de schilderijen in de tentoonstelling toonde de binnenplaats naast het stadhuis van Culemborg. Dat vond ik opmerkelijk, maar ook leuk, want andere kunstenaars hebben vele malen de voorkant van het stadhuis in schilderijen en tekeningen vastgelegd. 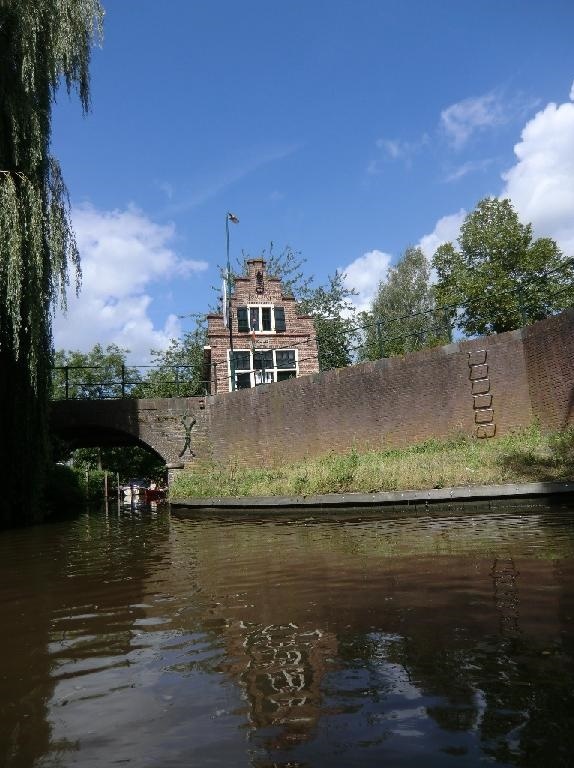 Vanmiddag was ik in Culemborg en terwijl mijn vrouw diverse winkels bezocht, ben op zoek gegaan naar deze binnenplaats. Uit het schilderij kon ik opmaken dat het tafreel zich aan de linkerkant van het stadhuis moest bevinden. Dus aan de zijde waar het gebouw met trapgevel links naast het stadhuis te zien is. 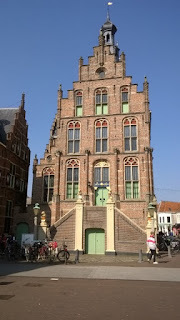 Via een smalle straat kwam ik uit aan de zijkant van het stadhuis. Ach moet je dat wel doen? Want na 160 jaar is er natuurlijk niets het zelfde. Het is grappig om te zien dat het hoge gedeelte, links in het schilderij, er in werkelijkheid strakker uitziet dan Weissenbruch het weergeeft. Maar de lucht is in het schilderij veel mooier dan in de foto. hi. Het blijft een prachtig schilderij. Klik even om te vergroten. Martin G4EFE is an enthusiast milliwatt WSPRer. I curiously follow the WSPR adventures of Martin in which he uses very low power. Here I show new analysis of the spots that Martin made with a power of 5 milliwatt on 40 m with a full-size 40 m square loop. The table shows the number of spots over a three day period, from day to day and hour to hour. 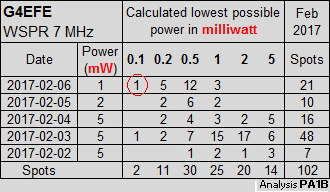 From the used power of 5 mW (in all spots) and the SNR, I calculated the lowest possible power. A spot with a SNR of -28 dB is a "solid copy" in WSPR. So when, for instance, the SNR is -18 dB, the signal is 10 dB stronger and could have been 10 dB lower and still give a solid copy, with a SNR of -28 dB. lower the calculated lowest possible power will be. In the spots that were received by F6EHP, you can see the development of the propagation from hour to hour. You can see that the signal peaks at 9 UTC at 3-2-2017. The strongest spot could be made with a power of 0.1 milliwatt. This is also the strongest spot in this table. Martin uses his IC703 and an attenuator to make a power of 5 milliwatt. His antenna is a full-size 40 m square loop. As I saw on WSPRnet. De cilinder dipool is een interessante antenne, die zelfs binnenshuis gebruikt kan worden. Vooral met de cilinder dipoool met Monster blikken, die bij uitstek geschik is voor 21 MHz, heb ik al veel QSO's gemaakt. Ik heb vandaag enthousiaste reacties gehad van BQC leden, op het artikel over de cilinder dipool in Nieuwsbrief 161 van de BQC, tijdens het bezoek aan de Vlooienmarkt in Rosmalen. In het artikel over de cilinder dipool met Monster blikken wordt verteld, dat de capaciteit tussen de blikjes overgeveer 6 pF is en deze capaciteit een essentiële rol speelt, bij de werking van de cilinder dipool. Er wordt uitgelegd dat de cilinder dipool zich gedraagd als een parallelkring, de blikjes niet van blik zijn, maar van aluminium en welke voordelen dit biedt. Verder wordt uitgelegd dat de cilinder dipool via een 300 ohm lintlijn gevoed wordt en daavoor een symmetrische tuner gebruikt wordt. Veel leesplezier met de BQC Nieuwsbrief. 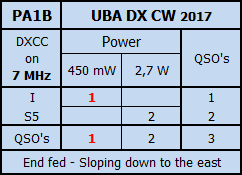 I was looking forward to participate in the UBA DX CW contest with QRPp. This is a very nice contest with a lot of activity. I found out that my End fed antenna is working fine. This time I also made a few QSO's on 7 MHz. I discovered that I had to use a longer twin lead on 7 MHz than I use on 14 MHz. I made most QSO's on 14 MHz using QRPp. 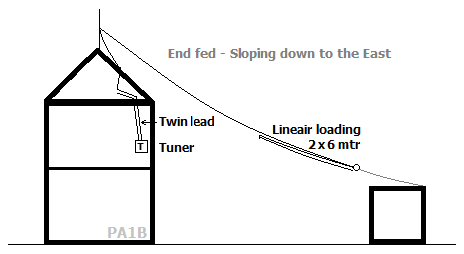 Click to see my End Fed with a twin lead feeder. I came back home late, so I made 1 QSO on 14 MHz and 3 QSO's on 7 MHz on Saturday. On Sunday I made 23 QSO's with 360 mW and 7 QSO with 800 mW to 3.6 Watt. I am very pleased that I could make that many more than 1000 Miles/Watt QSO's. I ran the FT-817 without the attenuator. The lowest power of my FT-817 is 360 mW, after a serious mismatch. But as you can see, this low power is still working fine most of the time. Hi. All QSO's were made with Search & Pounce (S&P). I only increase my power when I am sure that my low power signal is not heard. Using low power, is absolutely not that difficult and is great fun. 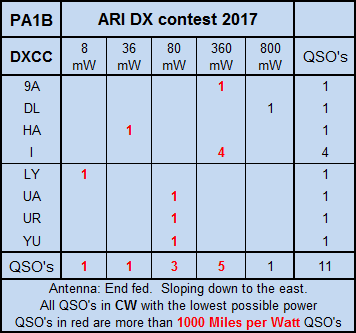 I was hoping to make QRPp QSO's in the ARRL international DX CW contest 2017. I did not make many QSO's, because I had very limited time on both days. But I did enjoy the contest very much. A week ago I made an End fed antenna to work in the PACC. The antenna is sloping down to the east, so I was curious how the End fed would do to the west. I am not disappointed. Because I was away for most of the day, I started late on Saturday on 14 MHz. In the first 3 QSO's I had to use 3.6 W and 1.8 W. After that I could reduce to 800 mW. When the band closed on Saturday evening, I had made 11 QSO's all with Search and Pounce (S&P). The signal of K1ZZ was very strong, so I reduced to 360 mW before answering his CQ. The response was immediately correct. When I started on Sunday I could hear European stations. On 14 MHz I could only hear stations that I had worked before on Saturday, so I went to 21 MHz. 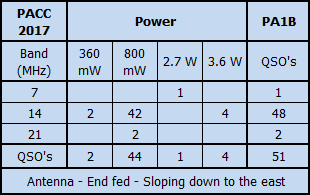 On this band I could work 6 stations all with just 800 mW, as you can see in the table below. I could work with W3LPL with 360 mW. His response was also immediately correct. hi. 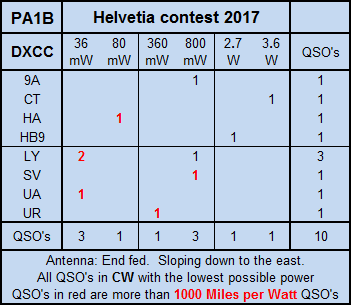 Numbers in red are "more than 1000 miles per watt QSO's"
Working with QRP and QRPp is great fun. 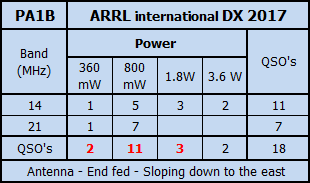 In the ARRL DX CW contest the DX stations like myself give their power in the report. When I reduce to less than 1 watt, I will give the report 599 001. This report can create some confusion. When I use 3.6 W I will give 599 004. I will give 599 001, when I use a power of 800 mW, but also with 360 mW. One operator was quiet for one full second after receiving my 599 001, before he realized that my power was about 1 W. Hi. When I met K5ZD and N1TA, their signals were not that strong and the QRM was increasing. I was really surprised that they could hear my 800 mW at all. But we could complete the QSO with no trouble at all. FB. Probably they had less QRM than that I had. I am very pleased with my End fed. It works fine to the east and to the west.